Jean Sturm (FR) is the designer of Musica. 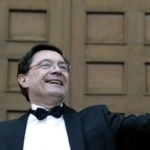 In parallel as a choral director, clinician of conducting classes and workshops, and manager of choral events–such as the Europa Cantat IX Festival in Strasbourg in 1985 – Jean has an extensive computer programming experience through his professional activity as a scientific researcher. Musica is a synthesis of his various skills. In 2014 he was awarded the rank of Chevalier des Arts et des Lettres by the French Ministry of Culture, with special mention of the Musica project.